I am participating in a sponsored campaign hosted byAdvil® for IZEA. I received compensation for this post. All opinions stated are my own. Hi! Welcome to repurpose day. You guys know the JTS (aka hubby, aka Junktion Technical Specialist) does the heavy work around here. Since he’s under the weather I’m taking charge. I can handle some furniture repairs and I can take things apart like nobody’s business. 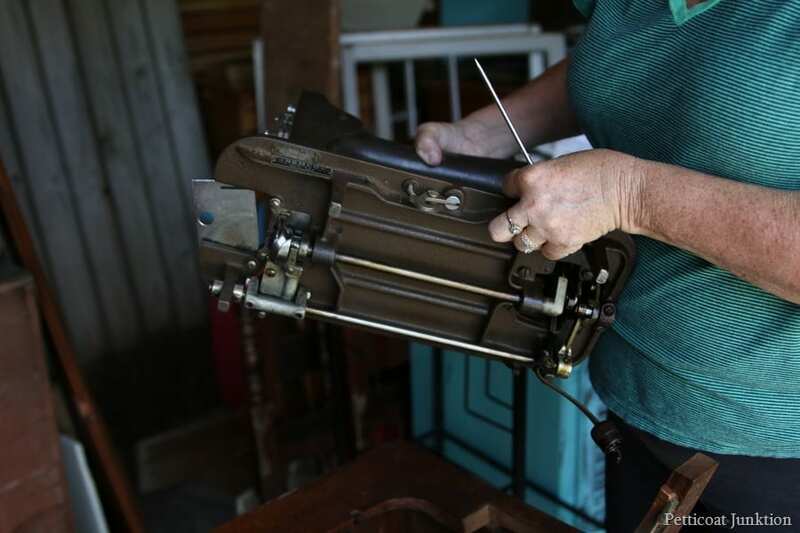 Today I’m taking something apart….kind-of. 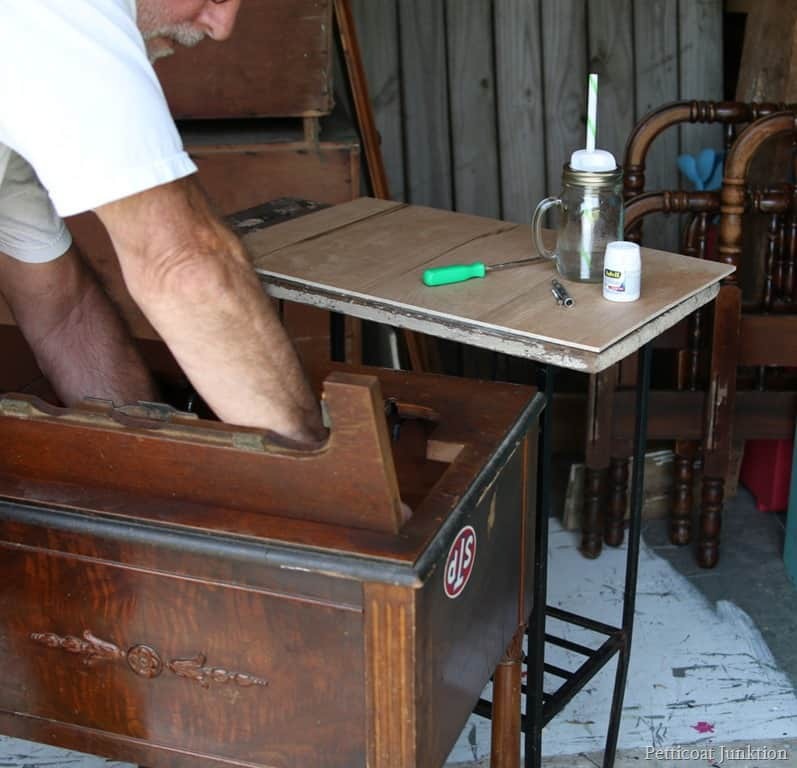 The JTS bought this vintage sewing machine cabinet at an auction. I decided to repurpose the cabinet as a bedside table. It’s the perfect height and I love the detailed legs and little curlicues. First thing to do though is take out the heavy sewing machine. The JTS and I looked it over and decided on a plan of action. I only needed to remove two screws and the sewing machine was out. I did the heavy work while he took the photos. Until he gets to feeling a little better that’s the way we’re working. There were two hooks attached to the backside of the machine, one on each end. You can see one of them in this photo. ·The sewing machine slipped right off those hooks after I removed the screws. 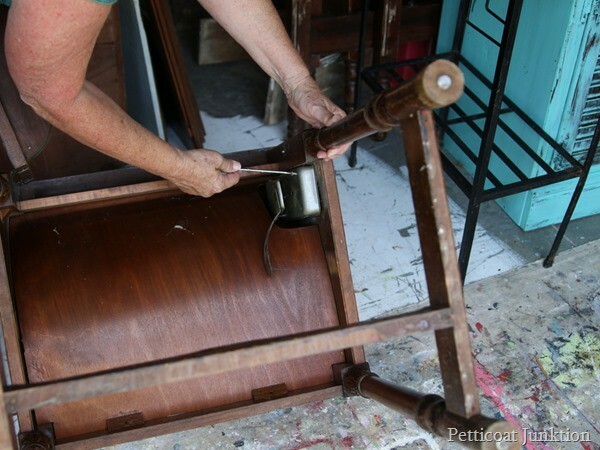 Next I flipped the cabinet over and started working on the knee pedal. That’s how this machine operated. You pressed your knee against the pedal to make the machine run. 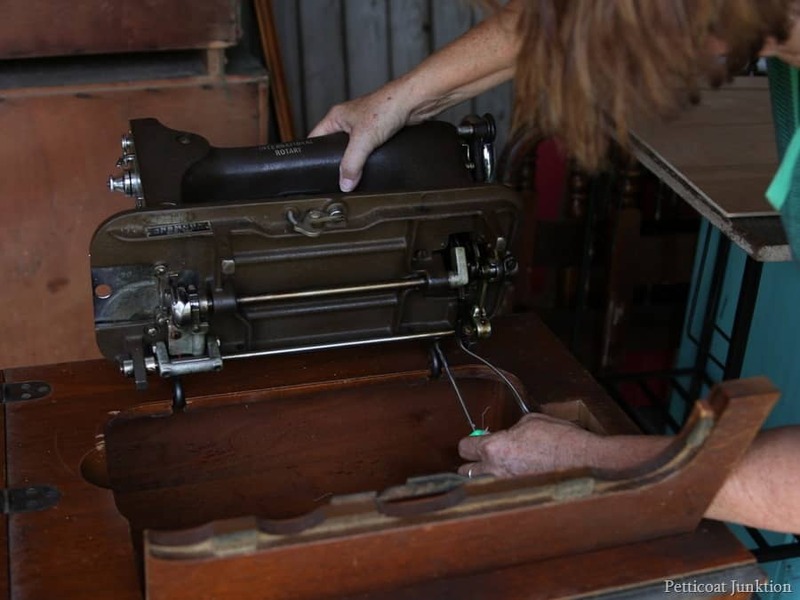 I used a sewing machine similar to this one in my younger days…..really. The JTS couldn’t resist getting hands on. I think he was tired of me giving him photography lessons. Plus he’s hard to keep down. The machine and knee pedal were out so we closed the top and…..
….screwed it down so it wouldn’t come open accidentally when moved. 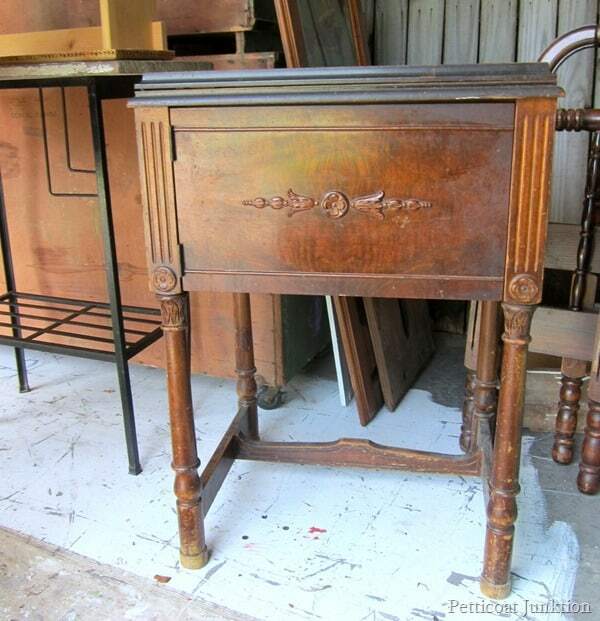 The plan is to paint the cabinet off-white and distress all those lovely details. I had a couple more projects to put finishing touches on so I saved the painting for another day. After standing on the concrete floor in the workshop for a couple of hours and taking the sewing machine apart, my old body was feeling it. When I’m done for the day and sit down at night the top of my right leg aches and aches. It hurts on the outside of my leg below my hip. Don’t know why, it just does. I take Fast Acting Advil® so the pain goes away and I can get some sleep . There’s always tomorrow and more projects! I know you guys are DIYer’s. Guess what! You could win $15,000 CASH. This summer home improvement expert Carter Oosterhouse is teaming up with Advil® to help consumers get through their toughest DIY projects. 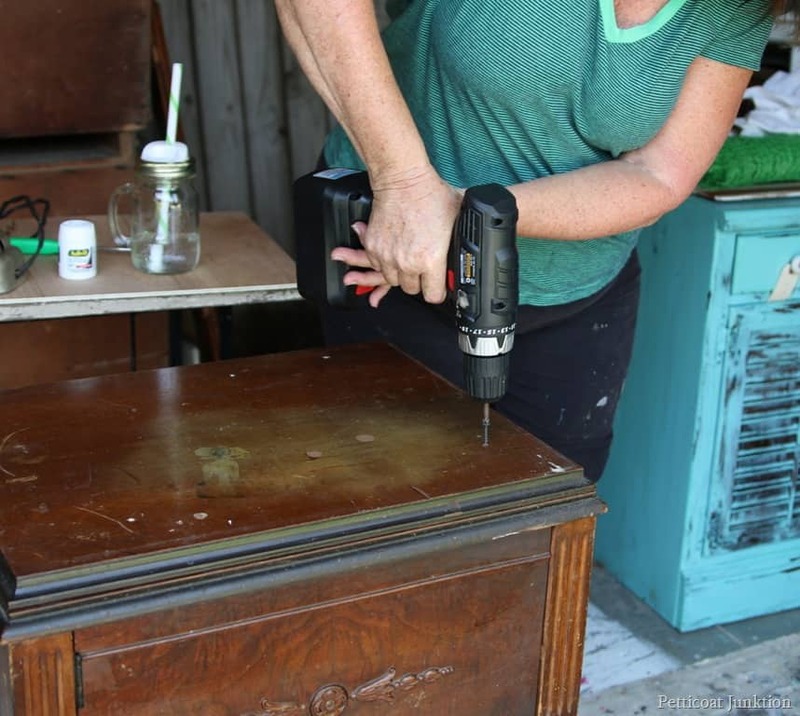 Upload photos of your DIY project to Twitter or Instagram from now until September 7th using both #DIYrelief and #AdvilSweepstakes to enter for daily prizes. A grand prize winner will win a video conference call with Carter, where he’ll help you plan a DIY project for your home as well as $15,000 CASH to use toward a tough DIY project. 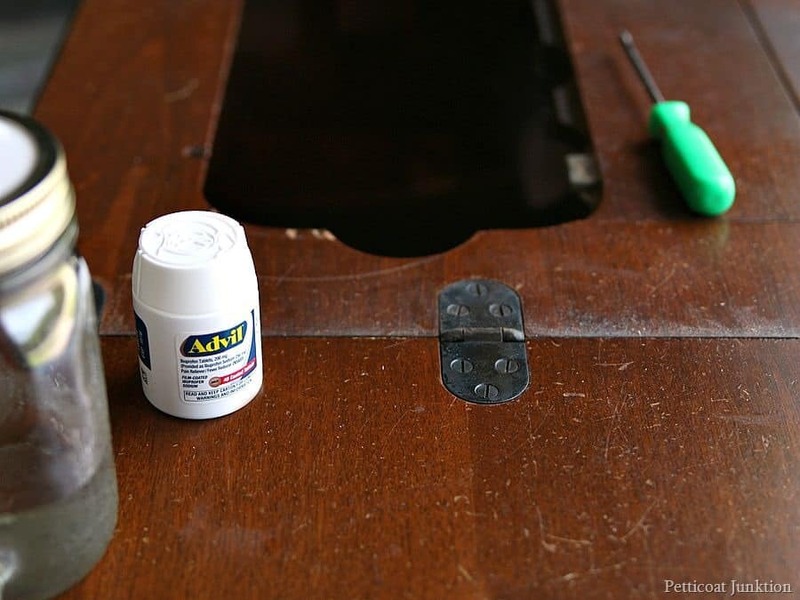 Visit Advil.com for more information on how Advil® can take the pain out of DIY. That’s not much to do for a chance at $15,000. Don’t forget to upload those photos and use both hashtags! You guys stay tuned…I’ll have this DIY project completed really soon.